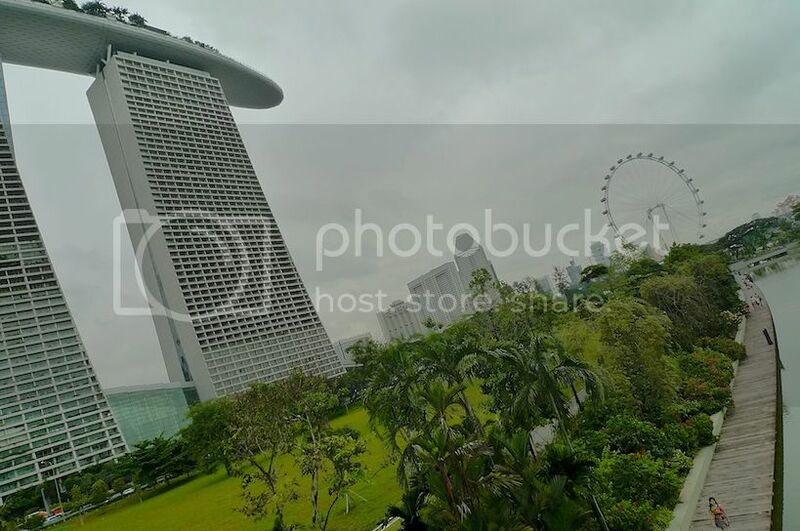 On Christmas Day last December, I visited Singapore. It was a one-day trip with my friend Jim after visiting Legoland and JPO with him in Johor Bahru the day before. 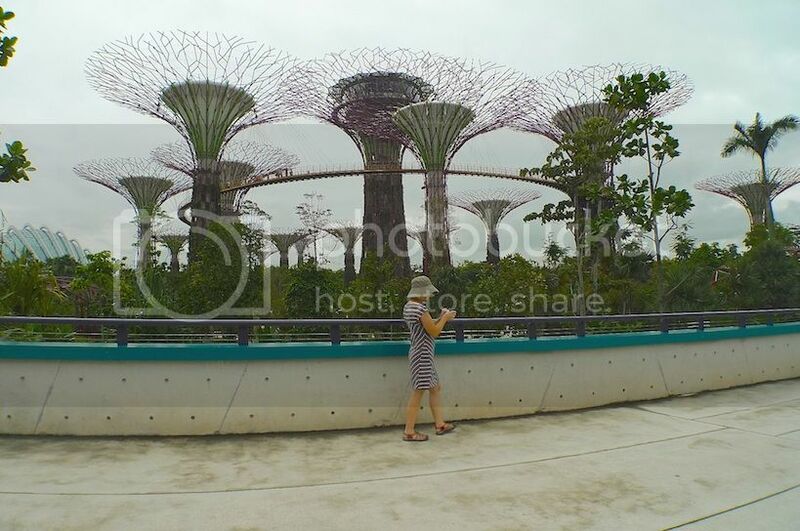 It had been many years since my last visit to Singapore, but since I only had one day, I decided to visit a place I have never visited before, and that is, the much talked about Gardens by the Bay. 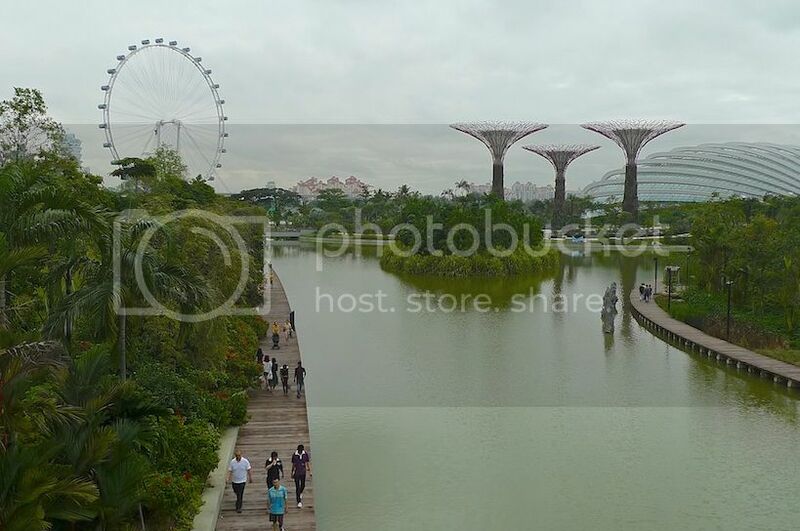 Getting to Gardens by the Bay was pretty easy. 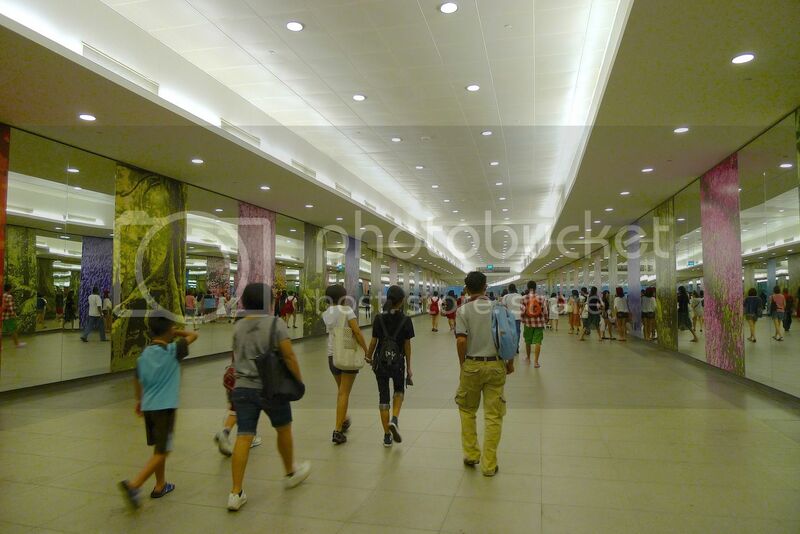 We took the MRT (North South Line) from Kranji MRT Station and alighted at Marina Bay MRT Station. 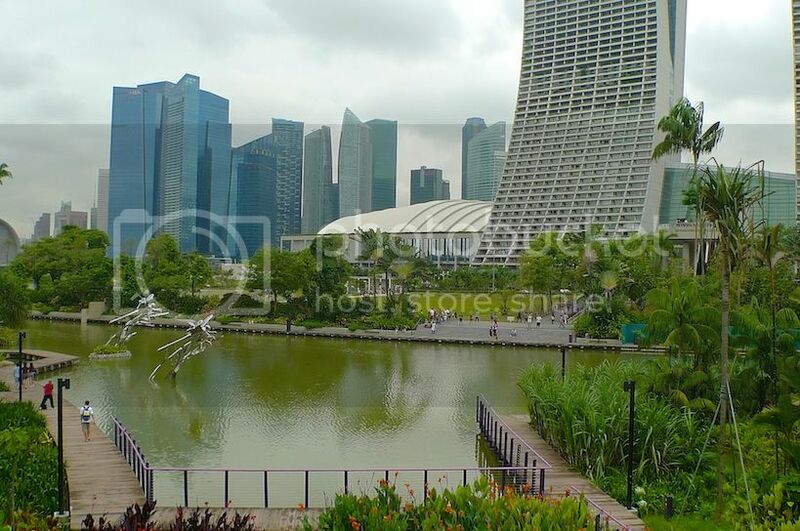 From there, we switched over to the Circle Line and alighted at the next station, which is Bayfront MRT Station. We then took Exit B and followed the underground linkway. I love the underground linkway! 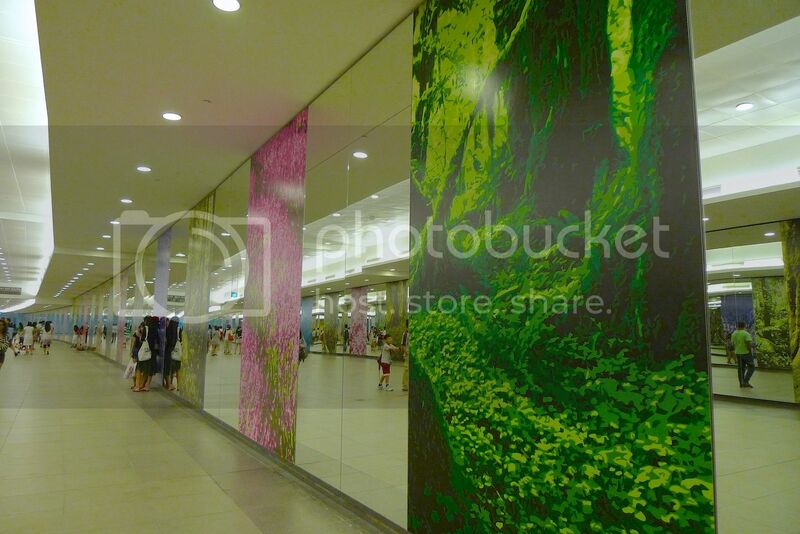 It was brightly lit and beautiful with colorful pictures of plants along the mirrored walls on both sides. 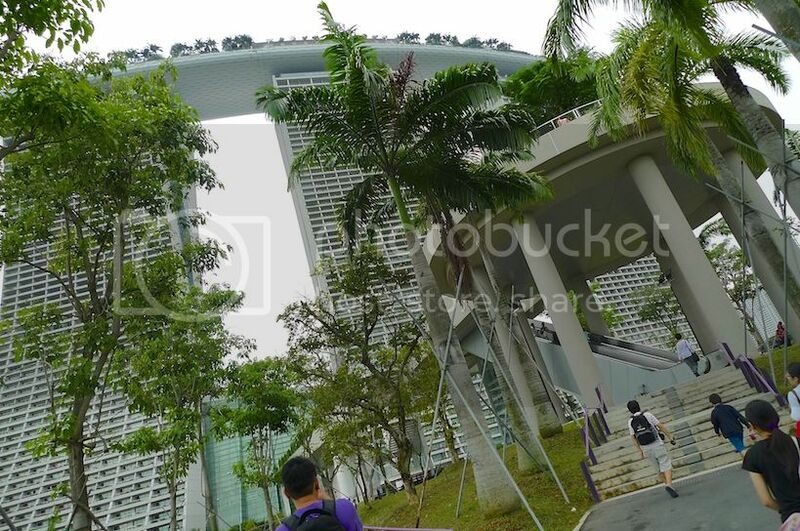 Coming out from the underground walkway, we could see the famous Marina Bay Sands building on our left. 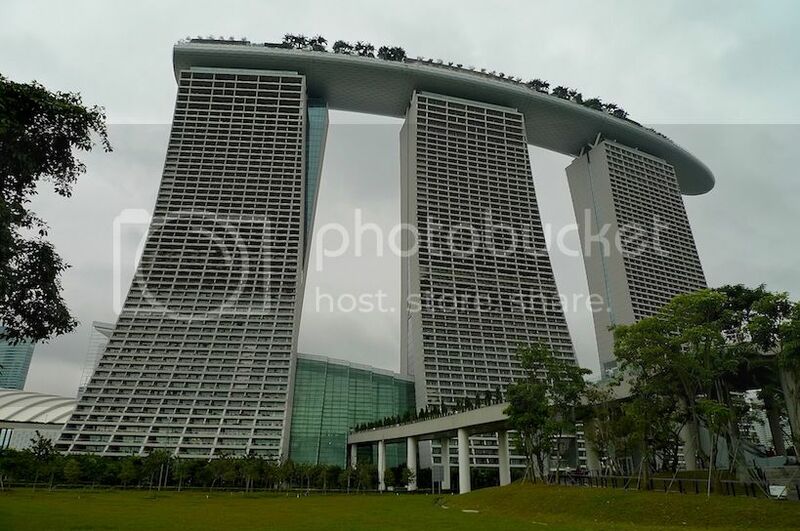 If you do not already know, the three towers of this hotel are connected by a sky terrace at the top called SkyPark, which housed the world's longest elevated infinity swimming pool! From where I stood at such close proximity, I was awe-struck by the magnificence of this impressive looking building. Walking a little further, we soon reached the Dragonfly Lake. Can you see those cluster of giant trees in the distance? 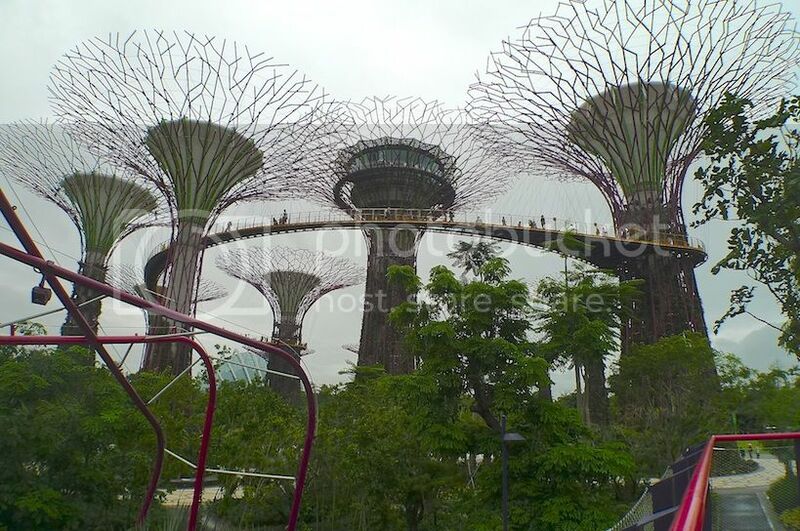 Those are the amazing Supertrees! More about that later. There were two giant dragonflies on the lake. But from this angle, you can only see one. See that bridge spanning across the lake? That's the Dragonfly Bridge which we need to get on to cross over to the Gardens. 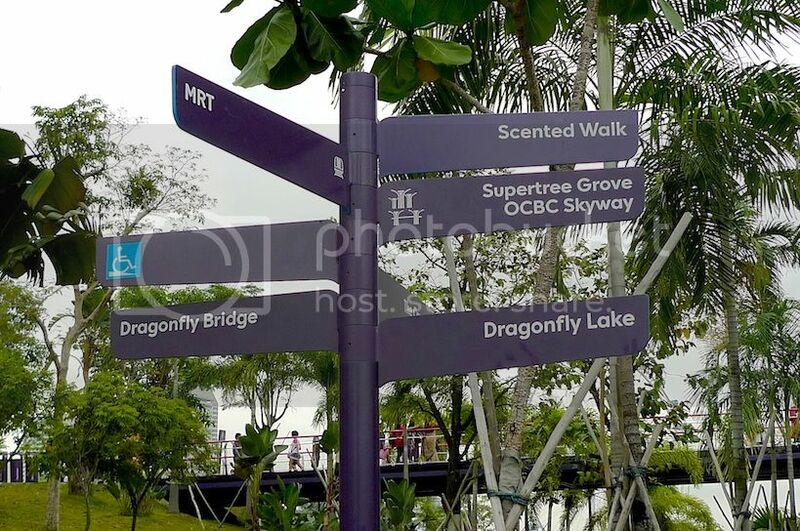 We headed towards the Dragonfly Bridge. 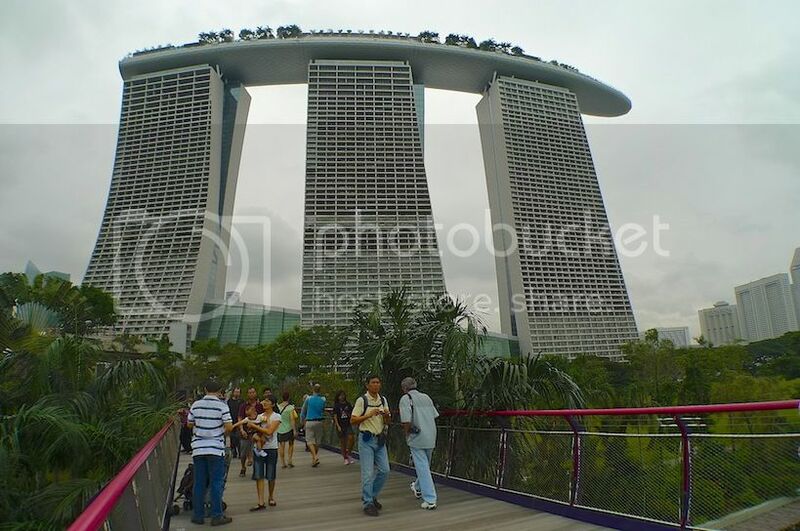 There's an escalator on the left going up towards a bridge linking to Marina Bay Sands, which we visited later in the day. 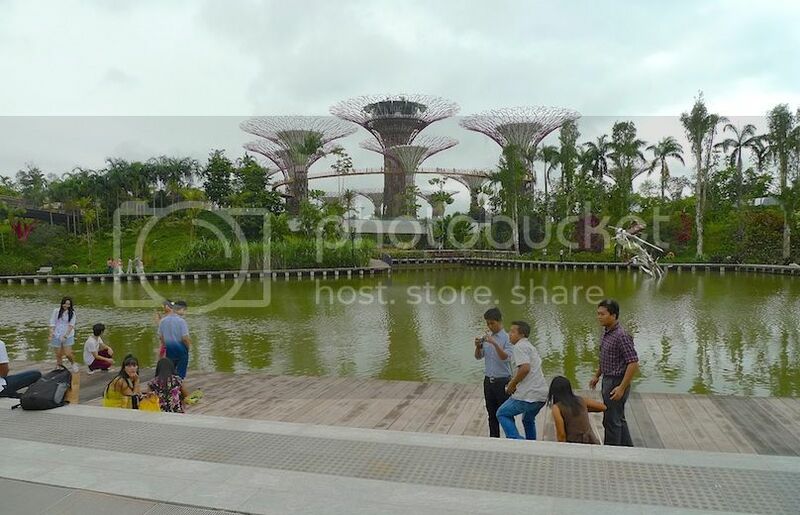 At the open space area near the Dragonfly Bridge, some people posed for photographs. 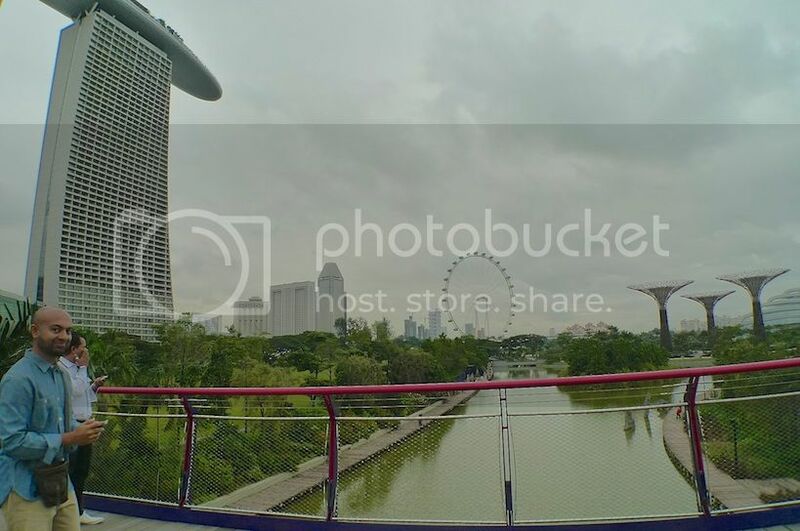 From here, I could see the famous Singapore Flyer, which is the tallest Ferris wheel in the world. I had seen the Lego version a day earlier at Legoland in Johor Bahru, but here I got to see the real thing. LOL! 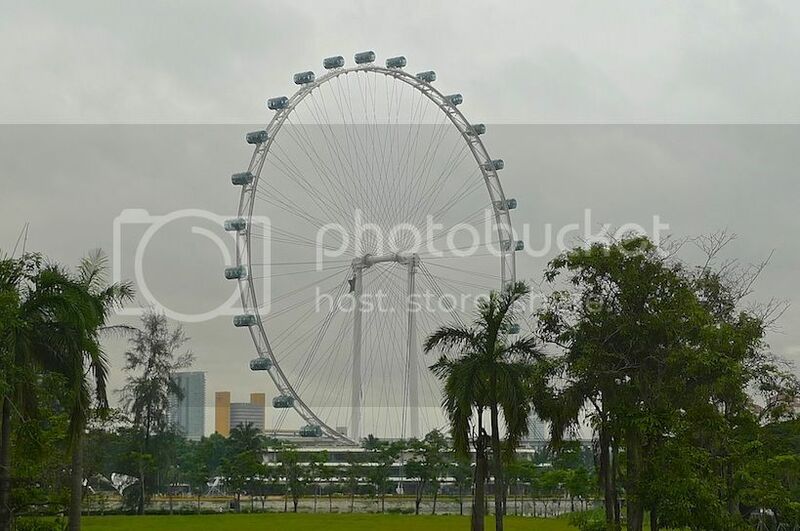 Did you know that the wheel which originally rotated anti-clockwise when viewed from Marina Centre was changed to clockwise direction under the advice of feng shui masters? We stepped onto the bridge. The view from here was pretty amazing. I could see the Supertrees much clearer now. They looked like some kind of structures taken from a science fiction movie. Cool! 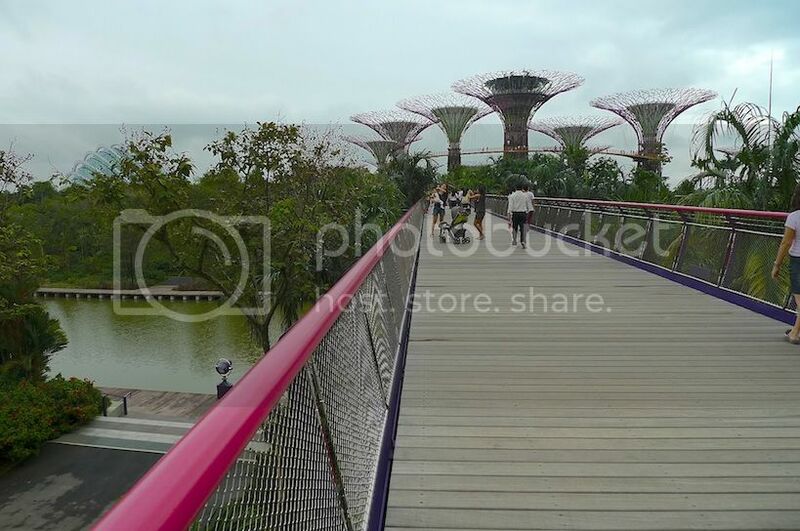 Can you see the elevated canopy walkway linking from one tree to the other? 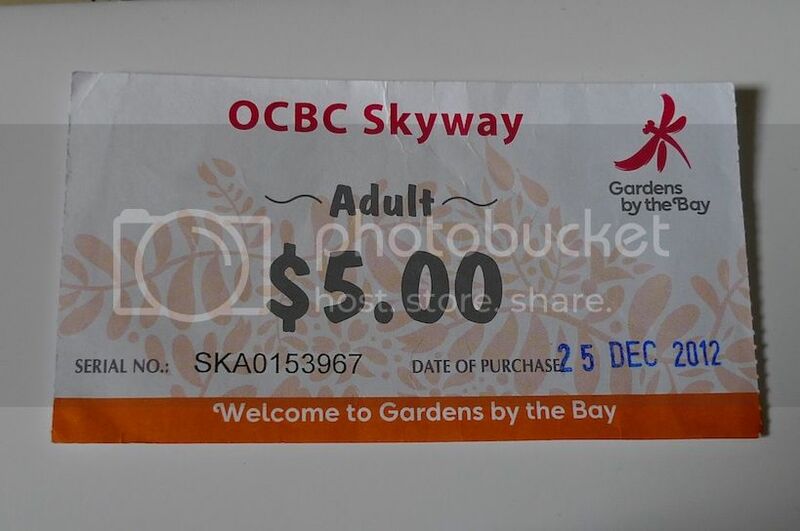 That's the OCBC Skyway! 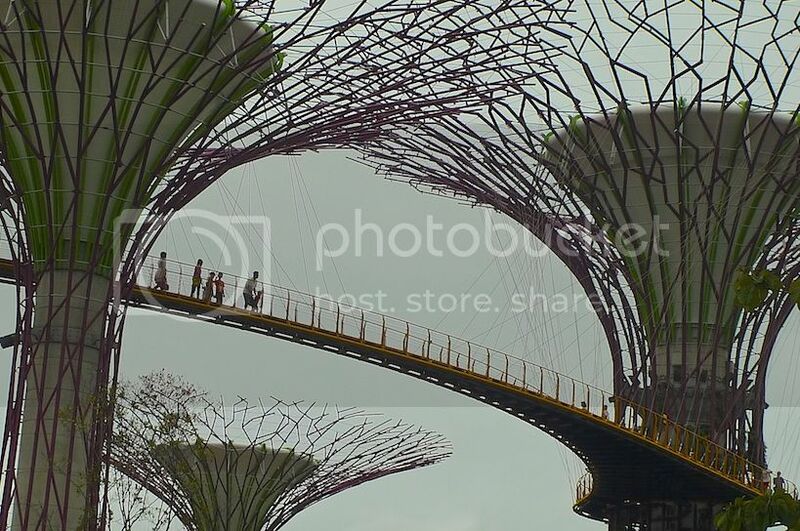 I guess OCBC Bank must be the sponsor of this canopy walkway! In the distance, I could see two huge glass domes. 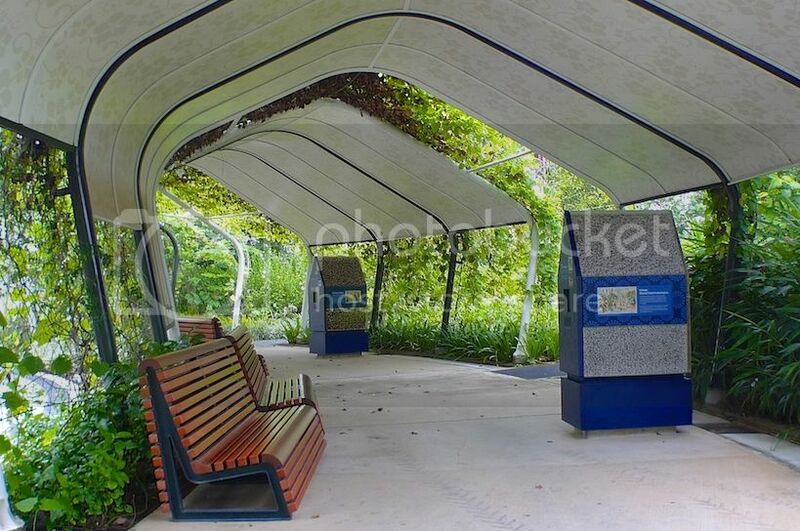 These are the Cooled Conservatories which is a must-visit for every visitor to Gardens by the Bay! On the left is the Flower Dome and on the right is the Cloud Forest. 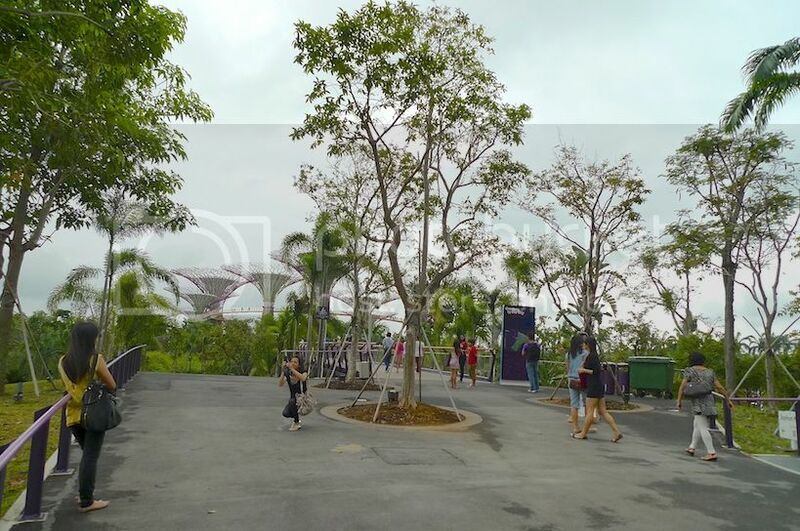 Access to the outdoor gardens are free, but entering the Cooled Conservatories requires a payment of SGD28 (USD22.60 / RM68.80) for foreigners and SGD20 for locals. The weather was pretty gloomy that day - certainly not good for photography but great for strolling around in the open air. 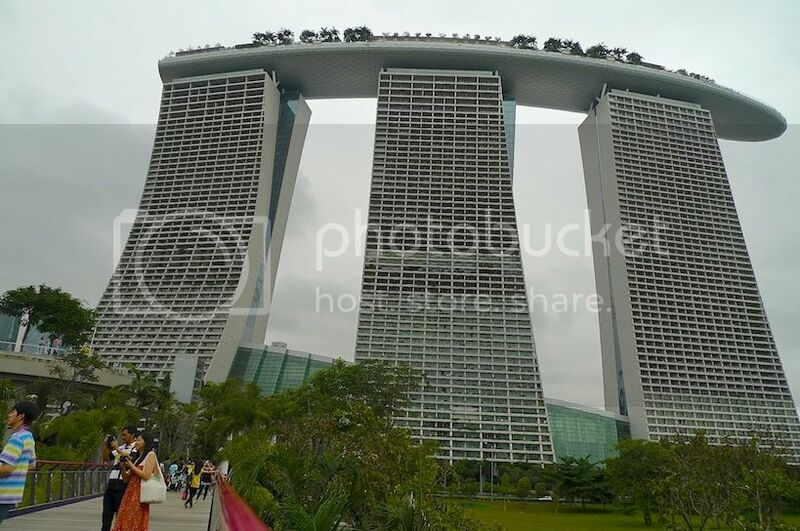 The view of Marina Bay Sands from the Dragonfly Bridge was awesome. I stood on the bridge for quite some time to enjoy the scenery and took a few more pictures. How could I resist? There were many visitors that day but thankfully, it was not crowded. The outdoor gardens area was huge! Because I was so busy taking photos, my friend Jim and I were soon separated, and I was left exploring the place on my own. I did not manage to walk the whole garden - I think that would require a full day! 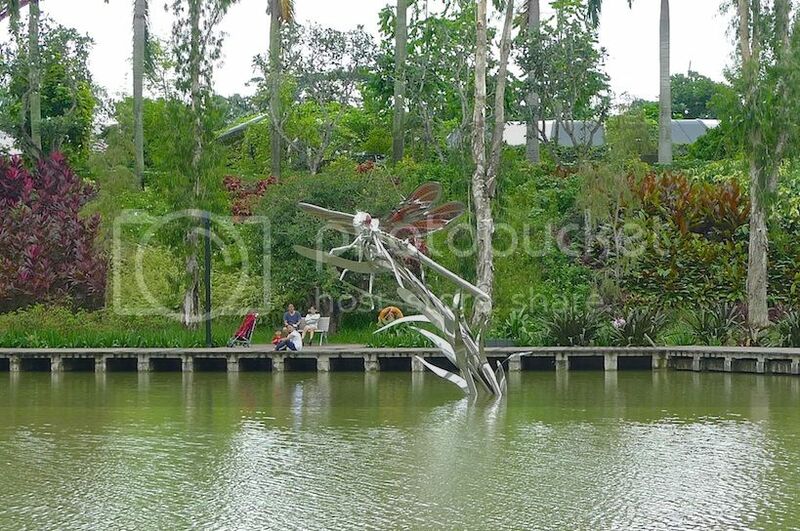 There were many themed gardens for example, the Chinese Garden, Indian Garden, Malay Garden and Colonial Garden. Besides, there were many other places to explore like The Meadow, the Supertree Groove, and the Silver Garden amongst others. Refer to the map HERE. A good way to have an overview of the whole Garden is to go on a 20-minute leisure ride on the Garden Cruiser complete with informative commentary as you take in the views around you. 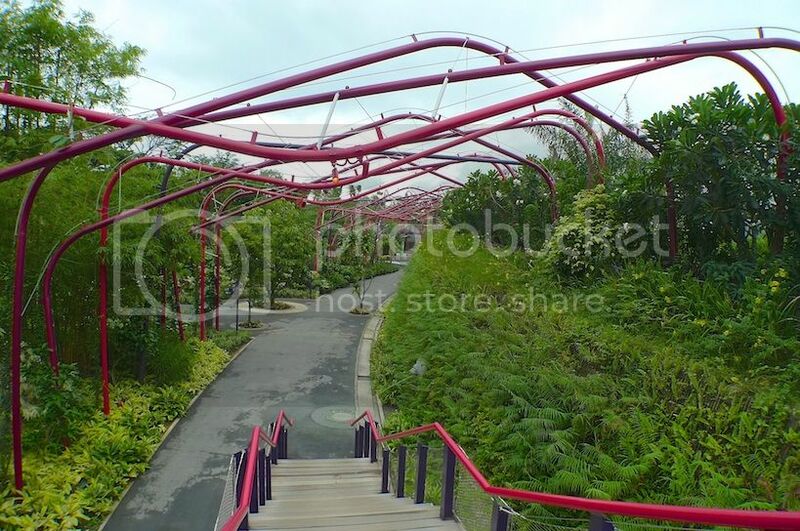 The ride is priced at SGD5 (USD4 / RM12.20). I did not go for the ride, but Jim did, as he later told me. I was really more interested in the Supertrees. In fact, I was fascinated with them. Here's a close-up shot of the tree tops. 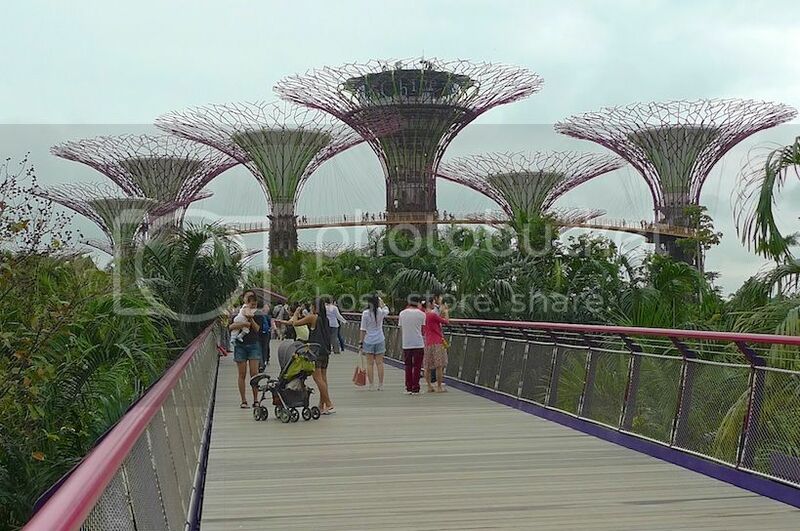 There were people walking on the elevated OCBC Skyway. I had wanted to take a walk on this Skyway but somehow, I did not. Instead I spent most of my time at the Flower Dome and Cloud Forest, which were amazing attractions themselves! Jim however, did try the Skyway. He even gave me his ticket as souvenir. Thanks Jim, haha! 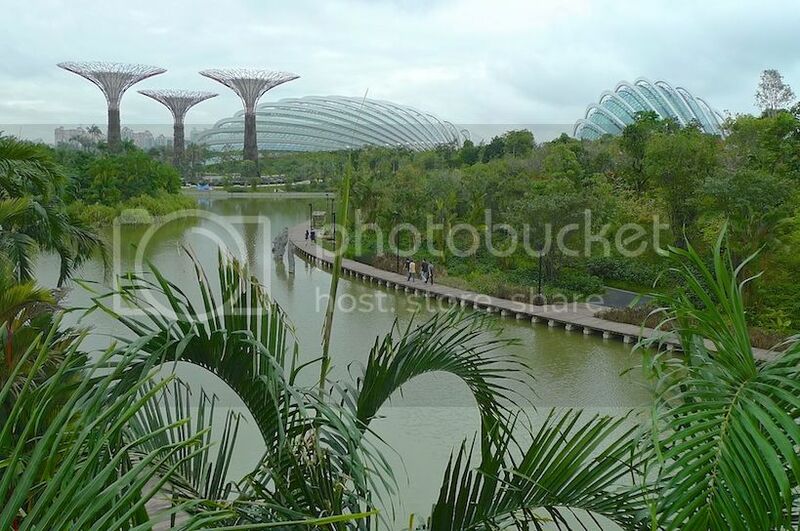 Now I have the perfect excuse to revisit Gardens by the Bay. It's to walk that Skyway! Honestly, I don't mind visiting this place a second time even without the Skyway. It's really that nice! As I leisurely walked the outdoor Garden area on my own, I soon came upon this spot which looked kind of familiar. Yes, I was on the opposite side of the lake earlier before I went up the Dragonfly Bridge. (Refer to the 4th photo above). Now can you see the 2 dragonflies in the middle of the lake? Earlier, I only managed to capture one in my camera. Soon, I reached another part of the garden with its weird looking arches. 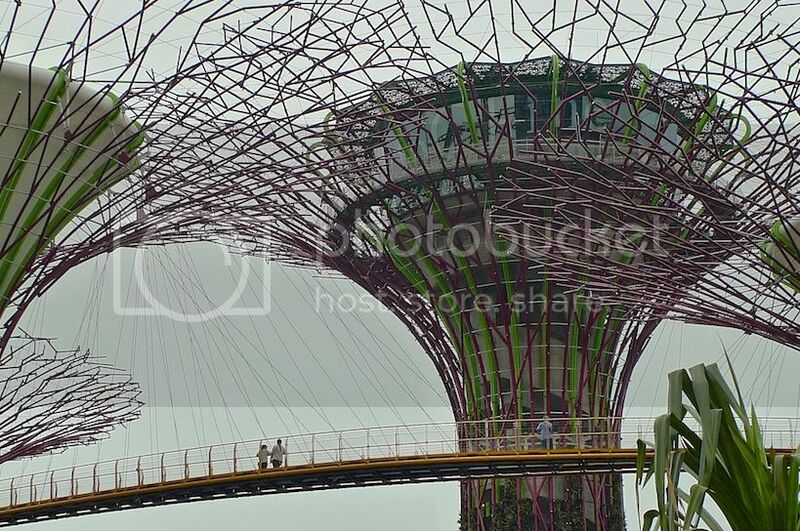 The Supertrees clusters could still be seen from here. I was distracted for a moment and veered off into this area. There were a few funny looking kiosks in blue. 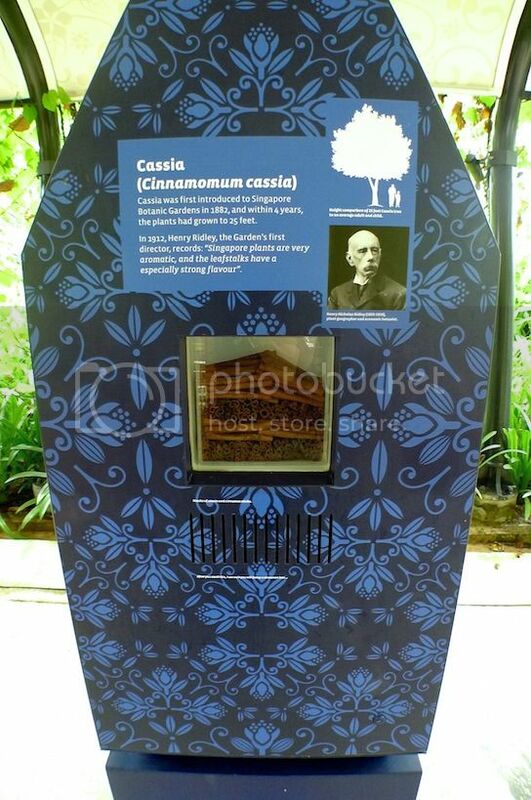 Each of the kiosks had information about certain plants. I did not bother to read them all, although I would if I had more time. Maybe next time, then. 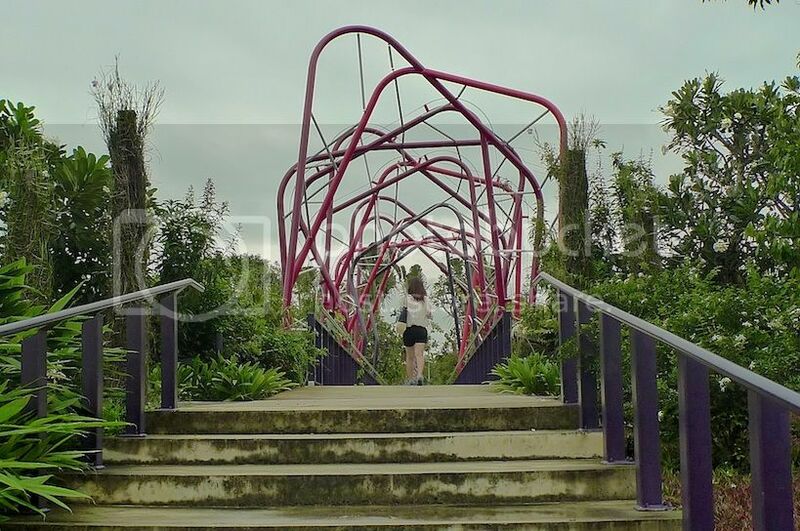 Then I saw a girl walking towards a very weird looking structure. Curious, I decided to follow her.